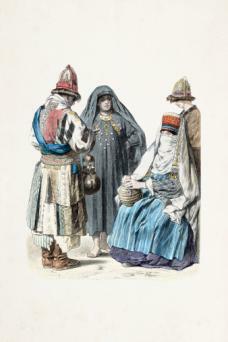 The styles of dress in Central Asia are as varied in appearance as are the ethnic origins of the people. Even in the early 2000s tribal groups living in remote valleys dress in a distinctive manner using their fabrics, their skills, and their accessories to accentuate their uniqueness. The demarcation of territories with borders is a recent phenomenon in Central Asia. Earlier the people moved freely and intermingled. The nomadic peoples' yearly trek followed a designated path known as "The Way" and for special markets or meetings of different tribal groups they traveled across many territories. The land as a whole was known as Turkestan, and it was only under the Soviet regime that it was divided into Turk-menistan, Kazakistan, Kyrgyzstan, Uzbekistan, and Tajikistan. Uzbekistan, which has the largest population, has a large number of Tajiks, Kazaks, and Turkomans who are citizens of the country. The Ferghana Valley covers parts of Tajikistan and runs into Kyrgyzstan running right up to Osh and has a culture that is more akin to the Uzbek than the Kyrgyz traditions. Despite the fact that the dress when seen worn by the people is distinctive, the basic structure of the main dress is very similar. This is perhaps true of all horse-riding nomadic cultures, qualities that molded the costume of the people of Central Asia. It is also interesting that the basic dress of men and women is also similar. A type of tunic or shirt, kurta, was worn by the men and women, with drawstring pantaloons, the salwar, which was very baggy at the top and tapered down to the cuffs, that were often decorated with embroidery or edged with woven tapes. The tunic has a universal pattern. It is made of a narrow width of cotton or silk, which more or less matches the width of the shoulders and was folded over to cover the body, falling to about 4 inches (10 cm) from the ankles. A circular cut was made for the neck; the older pieces were open at the shoulders, while later ones had a cut from the center of the neck. The sleeves were also straight and sewn into the sides and the body piece, with the sleeve opening extending below the armpit. Diagonally cut pieces, narrow at the top and broader at the bottom, were attached to the side of the body of the tunic below the sleeves. They gave the shape to the tunic. The section joining the sleeve would have gussets attached between the sides and the sleeves giving a greater freedom of movement. A girdle, futa, or a length of cotton or silk either of one color, striped, or printed was worn wrapped around the waist, which supported the waist as men and women had an arduous life of walking through mountain areas often carrying heavy loads. Over this dress they wore an open coat, chapan, of cotton or silk material, which was either padded for winter or was plain, depending on the time of the year and the status of the user. The khalat was the more elaborate stylized silk coat of striped silk, cotton, or richly patterned abr (ikat) silk. These were invariably lined to preserve the cloth and the lining was often of hand-printed cotton material. Sheepskin coats embellished with embroidery were worn in winter. Often men wore innumerable khalat one on top of the other to indicate their affluence. They began with the simplest at the bottom and worked their way up to the silk brocaded or velvet khalat given by the emir. Women normally wore an undershirt munisak and a tunic on top. In some cases women, too, wore more than one tunic and a shaped chapan on the top. The dress worn next to the body was embellished at all the openings. This was not only for decoration, but also to protect the wearer. The neck carried elaborate embroidery around the collar and the sleeves as well as the side openings. The cuffs of the salwar were also embroidered or embellished with woven tapes, zef. These tapes were tablet woven and carried elaborate patterns. The finest were the tablet woven velvet tapes used for embellishing the kahalats. The men's chapans or khalats were open in the front and had to be closed either with a shawl or with a leather belt with elaborate buckles. The belt was a sign of servitude and all the courtiers had to wear it when appearing before the emir. The most elaborate part of the dress was the headdress. Men, women, and children used the headdress and they differed from region to region. By seeing the embroidery on the cap, the ethnic group and area could be identified. The most common were hand-stitched and embroidered skullcaps. Turbans were used by men and women. The bigger the turban the more important the person. 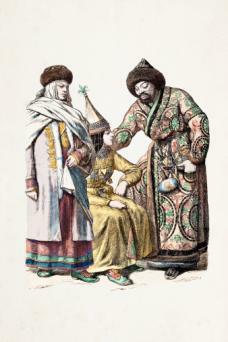 Women in Kyrgyzstan wore elaborate turbans, which were decorated with silver and gold jewelry meant especially for the headdress. Specialists wove the turban cloths, which could be of cotton or of silk. The indigo blue and white checks, chashme bulbul, the nightingale's eye pattern, was greatly appreciated. The skullcap worn by men was the base for the elaborate turban worn in public. The most elaborate headdress was the one worn by young Kazak and Kyrgyzi women. The high conical hat, Saukele, was nearly 28 inches (70 cm) in height. It was made of felt, covered with velvet or silk and edged with fur along its rim. It was elaborately decorated with coral, turquoise, strings of pearls, and embellished with silver and gold pendants, as well as coins. The women of Karakalapak, a remote area near the Aral Sea, also used these headdresses, which were heirlooms and passed from one generation to the other. The use of such pointed caps is possibly an ancient tradition deriving from the clothing of the Scythian tribes of classical times, as it is linked with the famous Saka-tigra khanda Saka, that is to say, Scythian with pointed caps. The Turkoman married woman wore an elaborate headdress covered with silver and gold work and over that she wore a richly embroidered mantle, which came over her head and covered her body. The mantle has mock sleeves at the back. The children were dressed with great care to protect them from evil influences and the evil eye. Silken shirts of children would be covered with amulets of silver as protective devices. A study of different ethnic styles of Central Asian dress reveals the importance of accessories in creating a distinctive dress. A remark made by an Uzbek woman "everyone knows how to put on a dress, but not everyone knows how to carry it off" is a very true indicator of a well-dressed woman among these tribal peoples. 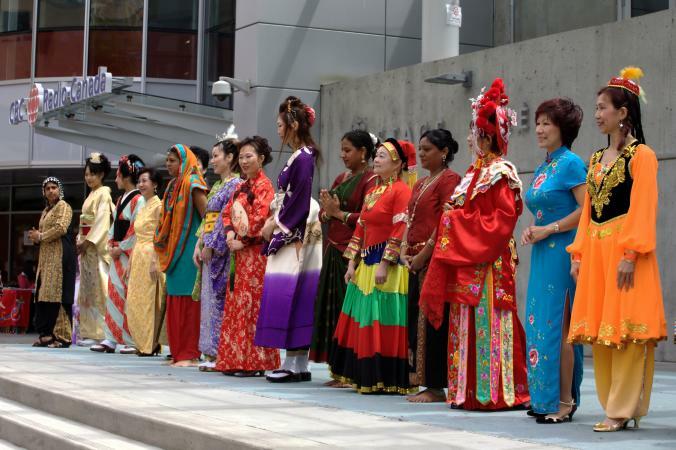 Though the traditions of dress in the area have ancient linkages, they are subject to change. The influences that lead to a change of fashion vary according to what is important within their own group. The changes in the past were less extreme and are more or less a case of variations on the same scheme. Records of travelers, which give descriptions of the dress of the people over the last couple of hundred years, indicate the changing fashions. The Soviet influence, especially in the urban areas, did introduce changes in style, but in the rural areas and among the older persons the style of dress remains to a great extent unchanged. The basic dress of the men and women was the kurta and the salwar, but over that they wore a full pheran, generally made of atlas, a woven silk, satin, or the mixed cotton and silk cloth commonly used by the women. For special occasions they would wear a shirt of abr, the brilliantly colored ikat weave. These would be embroidered around the collar and the sleeves, as well as on the edges or edged with tablet woven tapes. A coat was worn when receiving visitors or if stepping out of the house and the head would be covered with an embroidered cap and a large shawl. The coat and even the overshirt would be padded for winter and the coat would be lined with printed cotton and edged with silk. They also had the custom of wearing embroidered oversleeves, ton janksh, which were separate from the kurta and were taken off when washing the main garment. Over this an embroidered mantle, kok koilek, with mock sleeves was worn over the head. This was an essential part of their dress out-side the home; the older women wore white while the young married women would wear a red mantle. The salwar was also richly embroidered at the cuffs and peeped from below the kurta. Different types of scarves and shawls were used for wrapping around the waist. The headscarves would be either embroidered wool or the gossamer floating resist-printed silks of Bokhara. Young brides wore elaborately embroidered clothes and they also wore an elaborately woven and decorated veil over the face. The dress of the bride was often blue and richly covered, as well as embellished with jeweled plaques. The area of Karakalpak, which is near the Aral Sea and quite remote, has very fine embroidered dresses and accessories as cover for the head and the nape of the neck, which was considered very vulnerable. Bokhara was the main center for gold embroidery, which was prepared with a technique called couching to create a rich, raised effect. Couching is an embroidery technique in which threads are laid in a design on the surface of a base fabric and sewn to the fabric with small stitches that cross over the design threads. These outer robes were worn by women for special occasions, as well as by the men as khilats given to them by the emir. It was a tradition for the emir to present a full "head to foot" set of clothes to the male head of a family who was employed by the emir or was a member of the court. Men's dress was the kurta, salwar, with a cummerbund, a sash. Over this he wore a robe open in the front, which was held together either by a woven sash or a belt. 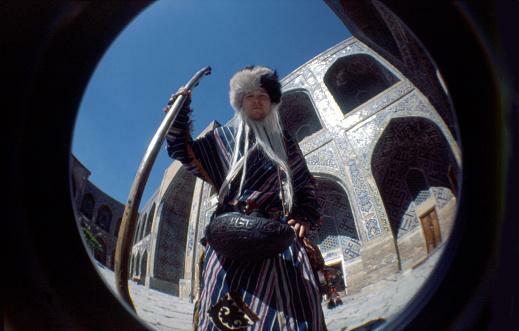 Skullcaps were an essential part of Uzbek national dress and came in a range of shapes and sizes. Some are conical and formed the base of the turban; others may be four sided, round, or cupola-shaped. All the caps were embroidered whether it was the simple gray or black cap with white embroidery or rich multicolored embroideries. Until recently the cap would identify the ethnicity and the region of the wearer. For the young brides elaborate gold embroidered caps with tassels were specially made. The Turkoman nomadic group came from the Altai Mountains. Their ancestors were the Oghuz and their traditions have been preserved in the "Book of Oghuz, Oguz Nama. Around the tenth century they were settled in the region east and south of the Aral Sea, when they came to be known as Turkoman. In the fifteenth century there were two confederations: Qara-Qoyunlu, "they of the black sheep", and Aq-Qoyunlu, "they of the white sheep". A number of the leaders entered Iran as shepherds and conquered it to remain as rulers; however, a large number of them remained in the area and evolved their own way of life with their swift horses, which were their pride and their lifeline; and their sheep, camels, and other cattle with which they migrated according to a seasonal cycle of available pastureland and water. However, their movement was not very far and it was confined to approximately within the radius of 31 miles (50 km). The round, felt-covered dwellings called Oy, yurts, were an essential part of the Turkoman way of life, and even the agricultural groups moved to the summer camps and lived in the yurts. The Turkoman's women's costume is similar to the tunic. It is made out of silk because there is no prohibition to wearing that material. The silk is of narrow width because of the loom and is generally woven in red with a yellow stripe near the selvage. By joining the side panels and retaining the yellow line, a very well defined linear quality emerges in the garment. Ordinarily women in everyday life wear a tunic with an opening up to the breasts, held together with a silver button at the neck. For special occasions they wear an inner tunic that is embroidered at the edges. The embroidery stitches are limited, however, as they are a number of variations of looped stitches and create a rich texture. The main stitch is similar to the feather stitch. The chain stitch, svyme, is used by the Yomut, along with the stem stitch. The joining of two pieces in a dress is done with a raised decorative herringbone. Extra-embroidered sleeves are also worn. Over that they wear a jacket with short sleeves, chabut, which is covered with coins or silver plaques, which end with elaborate silver pendants. They also wear a long coat among some of the tribes, which had become common in the beginning of the twentieth century. The coat was held together with a checkered sash, which hangs in the front and is known as sal qusak. Silver belts may be used, but only rarely. Turkoman women have an elaborate high cap, which has a base of a basketlike form made from coiled and stitched local grass and covered with silk. It is then decorated with silver coins, plaques, and chains and over that is worn a scarf, which is secured by chains studded with flat carnelian. On top of all this they drape the most dazzling piece of embroidery-a mantle with the chyrpy, carrying mock sleeves. The colors vary according to the age of the wearer. Young women wear blue or black, the middle-aged ones yellow, while the matriarch wears white. Another simpler headdress composed of a long, folded scarf, aldani, is used along with a skullcap, which was worn like a turban with its ends hanging to the left shoulder. Often one edge of the scarf is kept loose to be used for veiling the face. The pantaloons, salwar, have heavily embroidered cuffs worked in striped thick silk material. The baggy top is made from ordinary cloth to which the cuffs are attached. Only the embroidered part is visible from beneath the shirt. The pantaloons are tied at the hip. The men wore silk tunics, which opened on the side. A woven sash was worn around the waist and a salwar tight at the base and loose above. Woolen puttees with decorated edges covered their legs from the ankle up to the calf and long leather boots were worn. They wore sheepskin jackets or long coats with the fleece inside, which were extremely warm. The fleece shows at the edges. The finest coat is that made of unweaned lambs having a curly fleece nearly 4 inches (10 cms) long. The shepherds used to wear a felted coat, yapunca, which protected them from the cold and from rain and snow. The most characteristic element is their bushy hat with a long fleece, which extended over the forehead and sheltered the eyes from the glare, as well as from snow and rain. The abr silk khalat was also used for celebrations. Mostly, these have remained in the family chests as heirlooms and hardly ever worn. Kyrgyzstan is a mountainous country surrounded by deserts. The Tien Shan ("Heavenly Mountains") range separates it from the Ferghana Valley, part of which occupies the southwestern area of the country. The Kyrgyz's rich cultural traditions are seen in the mountainous areas of the northern part of the country, where they settled as they moved from the Altai Mountains in southern Siberia. The Chinese chronicles describe them as fair skinned, green eyed, and red haired. The Mongols arrived in the tenth century and the intermingling created a very sturdy, handsome people, whom even the Soviets could never change. The Kyrgyz have traditionally been a nomadic people, living in yurts. Even in the early 2000s many Kyrgyz have a yurt in their compound, and the death ceremony even in the capital city, Bishkek, is performed in a yurt. Their 100-year-old epic Manas tells the story of the warrior king and the migrations, of his people. It is the world's longest epic and the Manaschi, who recite the story, keep the oral tradition alive. The traditional dress worn by the men is often leather trousers, terishym, which are also used by women when they are migrating or helping with the animals. These are worn along with high leather boots for everyday, chaitik, or embroidered massey. Over that they wear a shirt and often a leather jacket with fur lining known as ton. For special occasions the older men wear a long coat, chepken, which may be held together by a sash or a leather belt with silver buckles, kur. Very fine suede long coats with extra-long sleeves were made with elaborate hook embroidery. The typical headgear is a conical embroidered felt cap with embroidery and a tassel at the top, ak-kalpak. For special occasions the urban men wore flat, gold embroidered caps with fur lining and fur edging the headdress. The women wore a long shirt, which was often made out of striped red and black cotton known as kalami or it could be of abr, the ikat of cotton and silk. For everyday use they would wear a sleeveless jacket and a padded long coat along with leather shoes. They wore a bonnet with embroidered ear caps over which a turban would be worn or a decorated cap. Long, embroidered plait covers were worn to cover the nape of the neck, which was considered to be vulnerable to black magic. The women favored greatly the brightly colored ikat striped cotton of Kodzhent, which was given a glossy polished surface with the use of egg white. This was used as a sash, as well as a scarf. Elaborate dresses, koinok, were made from silken patterned cloth known as kimkap, probably derived from the name for woven gold brocade of India, the kimkhab. For special occasions they wore a wraparound skirt, beldemehi. It was either made of velvet or silk with leather and fur lining, and rich embroidery. This could be worn easily on horseback and would cover them well, giving warmth as they rode their horses. The bishmant was the elaborate dress worn by brides along with a long, conical headdress decorated with gold, silver, pearls, and precious stones and often with a highly decorative veil to cover only the front of the face, while a gossamer colorful veil floated beyond from the conical hat. Older women wore elaborate turbans made of fine cotton, chosa. The turban was held in place by an embroidered strap. From beneath the turban, a draped cloth covered the neck and the front of the neck giving great dignity to the matriarch. On special occasions even in the early 2000s one can see in the mountain villages the older married woman astride a horse with her elaborate dress and headdress, riding forth to accompany the men, who are dressed in their finest embroidered leather coats and caps and who carry hooded hawks on their wrists. Jewelry is very much a part of the dress. Elaborate buttons were used on the dresses. Long silver and coral earrings, iymek, which extended nearly 9 inches in length, framed the face. Large pendants were worn on the breasts as protective shields and linked chains of pendants and corals were stitched to the jackets. Silver buckles were attached to the leather coats and belts of the men. The engraved symbols of the sun, the moon, the stars, the falcon (their totemic bird) and others, protected them from the evil eye. The magical skill of the silversmith associated with fire and molten metal imbued the wearer with strength to face the adversities of life. See also Cotton; Jewelry; Silk; Central Asian Textiles; Traditional Dress. Beresneva, L. The Decorative and Applied Art of Turkmenia. Leningrad: Aurora Art Publishers, 1976. Burkett, Mary. The Art of the Felt Maker. Kendal, U.K.: Albert Hall Art Gallery, 1979. Gafiar, Gulyam. Folk Art of Uzbekistan. Tashkent, Uzbekistan: Literature and Art Publishing House, 1979. Geiger, Agnes. A History of Textile Art. London: Maney Publishing, 1979. Harvery Janet. 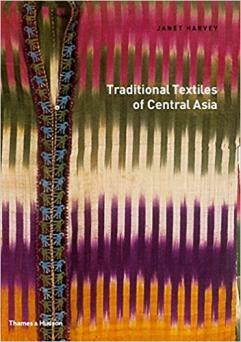 Traditional Textiles of Central Asia. London: Thames and Hudson, Inc., 1977. Sidenvagen, Vid. On the Silk Road. Göteborg, Sweden: Historiska Museum, 1986. Sumner, Christina, and Heleanor Fellham. Beyond the Silk Road. Sydney, Australia: Arts of Central Asia; Power House Publishing, 1999.